The Canaan Dog originated in the 1930s in the land of Canaan out of breedings of the wild dogs of Israel, which dated back to biblical times working as guard and herding dogs for the Israelites. Drawings of dogs which looked like the Canaan Dog were found in tombs that date back to 2200 BC. Arab desert-dwelling groups (Bedouins) still use the dogs for guarding their camps and sheep and for herding the flocks. The original story of the Canaan Dog begins with it being a pariah dog in the ancient times of Israel. Many believe that this dog breed could actually date back to biblical times, making it one of the oldest dog breeds still around today. Thought to be a herding dog and a guard dog of those ancient Israelites, the Canaan Dog roamed the region, helping to protecting the flocks of sheep and other animals as well as to guard those that slept in the camps. When the Romans removed the Israelites in the second century, the Canaan Dog began to lessen in numbers and may have come close to dying out in those scattered years. As the Israelites were moved, these dogs had taken refuse in the Negev Desert, which was a sort of oasis for Israeli wildlife. Roaming free, these dogs continued an undomesticated life, though they were helped by other cultures that drifted into the area. At one point, a Dr. Rudolphina Menzel found these intelligent dogs and used them as guard dogs for Jewish settlements, and through interbreeding, they became the Canaan Dog we know today. An incredibly reliable breed, the Canaan Dog is a natural herder that likes to complete tasks that require it to use its intelligence. While this sounds like it's only going to be good as a worker dog, this breed is also very easy going at the same time, sometimes even referred to as aloof. The Canaan Dog is able to handle tasks on its own, without much supervision and it thrives on being independent in this way. If you leave this dog alone for a while, it's not going to be upset with you, so it makes it a perfect breed for those that might not have a lot of time to give a dog breed a lot of attention. That doesn't mean that the Canaan Dog doesn't like attention, but that they don't require a lot of interaction in order to be satisfied. But the trick with a higher intelligence dog like the Canaan Dog is that they tend to become bored when they're doing repetitive tasks that they don't find stimulating. In longer training sessions, they can simply ignore commands and requests if they find something else that seems more interesting to them. It's best to continue to challenge them with new things that will allow them to continue to develop their learning. The Canaan Dog is also quite cautious around strangers, so they will need to be taught to socialize with people that will be in their life frequently. But this feature allows them to be high quality guard dogs. They will bark whenever they are in the presence of someone they don't recognize. This is a perfect dog for a family that wants a little extra protection or for a single that wants a loyal protector. 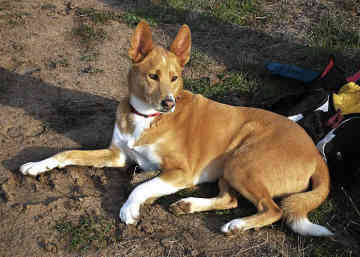 The Canaan Dog is also gifted in feats of agility, tracking, and chasing. It should also be noted that this dog breed is generally quite calm, which makes him a good dog to have in a family setting. And since this breed wants to be loyal to just one person or one family, it can be a great match. As one of the healthiest and hardiest breeds, the Canaan Dog is not prone to any major difficulties. The Canaan Dog is one of the easiest dog breeds to groom as the coat is simple to groom and to maintain. A weekly brushing with a coarse brush will help to keep stray hairs from becoming too much of a nuisance. Try to comb the hair out one a week as well to keep the appearance nice and healthy and comfortable for the dog too. It should be noted that this dog is a seasonal shedder, so you will have times of the year when shedding can be problematic- especially if you're not keeping up with the weekly brushings. The Canaan Dog is certainly going to want to be active, as its natural herding tendencies make it a more active breed that enjoys running around. This is certainly not a dog that will be happy just sitting around the house, doing nothing. You will need to create plenty of activity for this breed, including regular walks and physical activities that allow the breed to flex its intelligence and agility. You will want to not only take a Canaan Dog out for regular walks and let it run around without any direction for at least an hour each day, but you will also need to construct an intense training schedule that will help strengthen their mental fitness as well as their physical fitness. Playing games like fetch and other retrieval games might work well for their herding capabilities, but if this dog can use those skills in another setting - that is the preferred method. Constantly challenging this dog is going to be challenging for you and for the dog itself. You will need to create a program in which the dog is able to go on a long run with you and then perform challenging tasks at the end of that activity. If you aren't a naturally active person, you might want to rethink your decision to get a Canaan Dog as they can become irritable and upset when they aren't able to exercise as often as they would like. The Canaan Dog is what many breeders would call highly intelligence and absolutely trainable. They are more than willing to learn new tasks that are given to them and are likely to pick up new tricks and feats with ease. You can show them something and they can figure out how to repeat this task without much work at all. However, they naturally will follow the lead of the person they consider their 'herder,' so once you have established your position, training can become easier. That said, the risk with any highly intelligent dog is that they tend to become bored if they feel like your training is not challenging them enough. If they feel like something is not 'worth' their time, then will often resist the training and not listen to commands. In these instances, they can be very difficult dogs to train. They will require constant motivation and commands in order to keep them on task. You will want to have new activities that will challenge the Canaan Dog, perhaps having them look or hunt for things that you put in your yard or on a walk. They are natural herders as well, so any sort of activity that allows them to do this will also help to train them mentally as well as physically. Repetitive training is not advised for these dogs as they will become bored as they have probably already learned the task and want to move onto something else new and exciting. Like other breeds, the Canaan Dog will need to learn socialization skills at a young age in order to be able to determine who is a friend and who is a stranger. They are aggressive and will bark if they feel that they are with someone that can not be trusted, so as a puppy, they need to be taught how to behave. The trick with training the Canaan Dog is that you will need to be paying attention to everything they do during the session. These are dogs that can be manipulative and will try to avoid doing certain things that they may not want to do. With consistent training that involves some sort of reward, you will be able to manage their behaviors. Think about ways to encourage positive behaviors and to motivate this breed towards doing what you want them to do. They aren't necessarily going to respond to punishments that you dole out.